“The Cavalier. The young soldier and his horse on duty at camp Cheyenne,” by J. C. H. Grabill, 1890, Deadwood, Dakota. 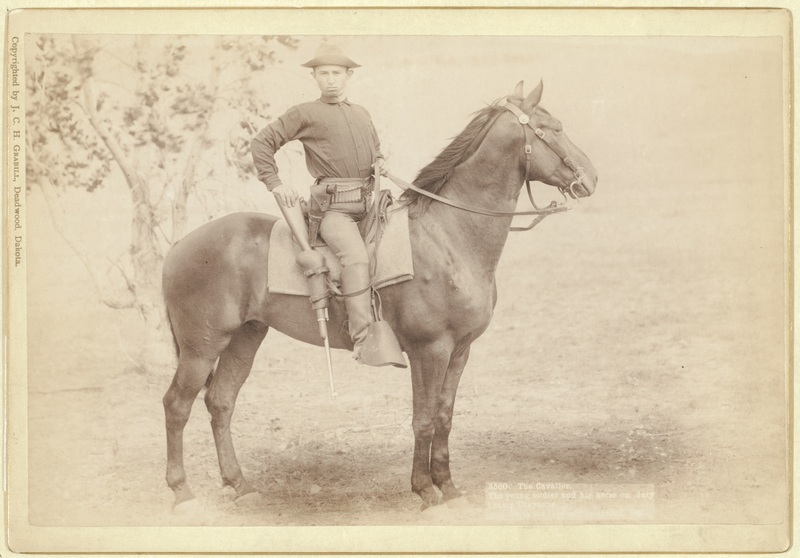 Privates in the 7th cavalry at Wounded Knee were equipped like the trooper pictured. Inset of Lieut. 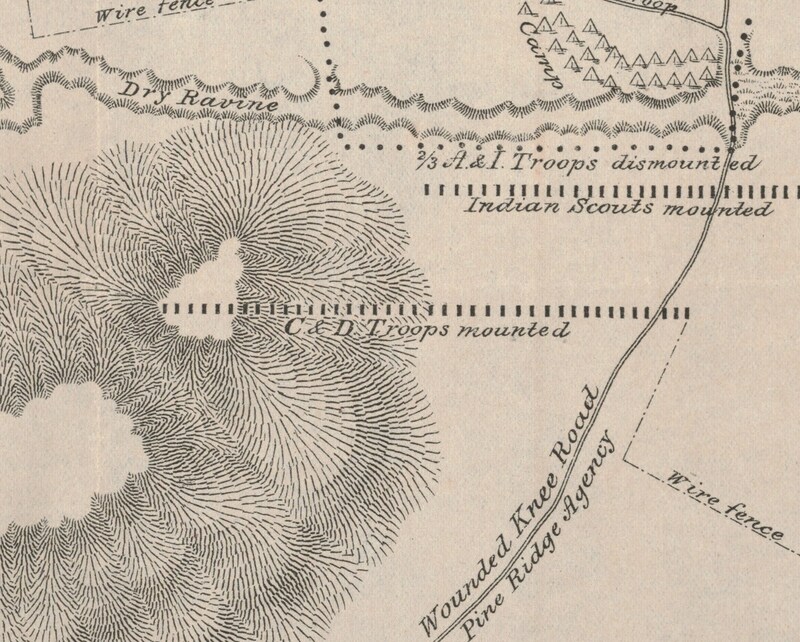 S. A. Cloman’s map of Wounded Knee depicting the position of C and D Troops, December 29, 1890. As there was only one man killed in D Troop, Second Lieutenant Tommy Tompkins must have been referring to Private Reinecky’s death when he stated in a letter to his father, “I was detached with twelve or fourteen men and had quite a little time. My men killed three bucks and I had one man killed and one wounded.” According to a New Year’s Day article in the Omaha Bee listing the soldiers’ causes of death at Wounded Knee, Reinecky was shot in the head. Tompkins described the action where Reinecky was likely killed in his testimony at General Miles investigation of Wounded Knee, “I was ordered down to the ravine to the left to hold the ravine and stop the Indians from firing into the rear of our line as they had been doing. There were a number of the Indians in the ravine; my men killed three bucks that I know of.” Private Reinecky and his comrades were buried two days later next to the Episcopal Church at the Pine Ridge Agency. The Evangelical Parish of Dierdorf, Prussia listing Franz Anton the son of Wilhelm Moritz Reineck and Katharina Heer. Reinecky’s given name was Franz Anton Reineck. He was born on 6 January 1858 at Dierdorf in the Kingdom of Prussia, what today is known as the Rhineland-Palatinate, Germany. His father was Wilhelm Moritz Reineck, a thirty-four-year-old tailor and native of Dierdorf, and his mother was Katharina Heer from Wissen thirty-five kilometers to the north. Wilhelm and Katharina were married in Dierdorf six years earlier and had a four-year old daughter, Katharina Maria, when Franz was born. Wilhelm was the son of a locksmith, Johann Friedrich Reinecke and his wife, Anne Elisabethe Schroeder. Katharina was the daughter of a cultivator, Simon Heer and his wife, Maria Chatharina Marzheuser. In 1866, Wilhelm left his family and emigrated to America, perhaps to establish himself in his new country before bringing his wife and children across the ocean. He settled in the village of Ravenna, Portage County, Ohio, working again as a tailor and anglicizing his name to William M. Reineck. Before joining her husband in America, Katharina died in April 1871. Her two teenage children made the trip alone in September of that year, arriving in New York City aboard the ship Ohio, also anglicizing their names to Catherine and Frank. Within two years of his children’s arrival, William married twenty-eight-year-old Sarah Deuble, the daughter of German emigrants who was working as a domestic servant for the Reverend George S. Davis in Ravenna, where the Reverend married the couple at his home. William and Sarah had at least five children over the next decade including Henry, who died in 1877; William who died in 1875, the same year he was born; Mrs. Bertha Mahoney, born in 1877; George Davis, born in 1879, and Frederick, born in 1883. By 1880 neither of William’s children from Germany, by then of adult age, were living with their father and step-mother. 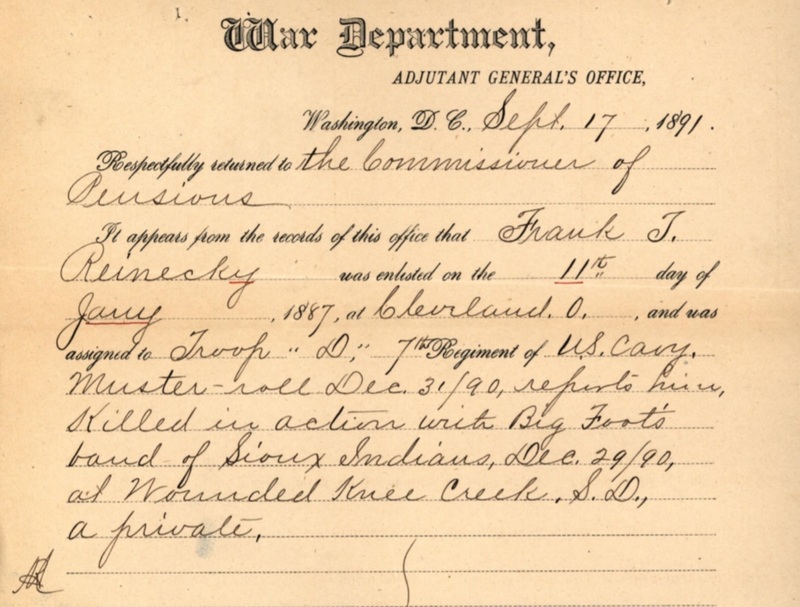 Abandoning the life of a butcher, Frank T. Reineck, enlisted 11 January 1887 at Cleveland, Ohio. His recruiting officer, Lt. Vernon, recorded his name as Reinecky and signed him up for five years in the cavalry. Stating that he was twenty-seven years of age, two less than actual, Frank Reinecky also stated that he was born at Long Island, N. Y, rather than his native Dierdorf, Germany. He had blue eyes, blond hair, a fair complexion, and stood five feet, seven and a half inches in height. Reinecky was assigned as a private in Captain Godfrey’s D Troop, 7th Cavalry. Letter from the War Department to the Commissioner of Pensions verifying that Private Frank T. Reinecky was killed at Wounded Knee. Following his death at Wounded Knee, William Reineck filed for a dependent father’s pension in July 1891, stating that his son was never married, had no children, and that he, William, had never remarried. He provided official documents from the Evangelical Parish of Dierdorf proving that he was married to Katharina Heer and that Franz Anton was their son. He also stated that he had no income and no one to support him, even though seven years later he was still working as a tailor and was living in Ravenna with his second wife and three of their children, including his eldest daughter, Bertha, and her husband, Henry Mahoney, a rail road brakeman. William died in January 1903, and his wife, Sarah, applied for the unpaid balance of his $12-per-month pension providing proof that she had been married to William Reineck for the past thirty years. More than three years after William Reineck’s death, his son’s body was disinterred in October 1906 and moved to Fort Riley, home of the 7th Cavalry Regiment in 1890, where Private Frank T. Reinecky was buried in the post cemetery along with most of his fallen comrades from Wounded Knee. 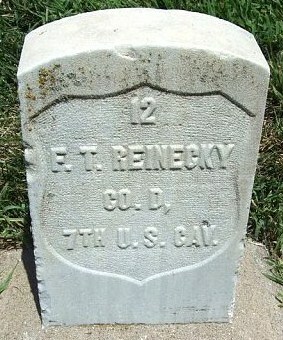 Private Frank T. Reinecky is buried at the Fort Riley Post Cemetery. Adjutant General’s Officer, “7th Cavalry, Troop D, Jan. 1885 – Dec. 1897,” Muster Rolls of Regular Army Organizations, 1784 – Oct. 31, 1912, Record Group 94, (Washington: National Archives Record Administration); Edward S. Godfrey, “Cavalry Fire Discipline,” Journal of Military Service Institution of the United States, Volume XIX,” (Governor’s Island: Military Service Institution, 1896), 259. Selah R. H. Tompkins, letter to Colonel Charles H. Tompkins, Carroll, as quoted by John M. Carroll in The 7th U.S. Cavalry’s Own Colonel Tommy Tompkins: A Military Heritage and Tradition (Mattituck, N. Y.: J. M. Carroll & Company, 1984), 74; Omaha daily bee., January 01, 1891, Part One, Image 1, (http://chroniclingamerica.loc.gov/lccn/sn99021999/1891-01-01/ed-1/seq-1/) accessed 4 Nov 2013; Jacob F. Kent and Frank D. Baldwin, “Report of Investigation into the Battle at Wounded Knee Creek, South Dakota, Fought December 29th 1890,” in Reports and Correspondence Related to the Army Investigations of the Battle at Wounded Knee and to the Sioux Campaign of 1890–1891, the National Archives Microfilm Publications (Washington: The National Archives and Records Service, General Services Administration, 1975), Roll 1, Target 3, Jan. 1891, 697-698. Adjutant General’s Office, The National Archives, Pension Application Certificate No. : 338377, Pensioner: William M. Reineck, Stack area: 18E3, Row: 5, Compartment: 2, Shelf: 4. Research conducted by Vonnie S. Zullo of The Horse Soldier Research Service; Ancestry.com, Germany, Select Births and Baptisms, 1558-1898 [database on-line], Provo, UT, USA: Ancestry.com Operations, Inc., 2014, FHL Film Number: 489978. William M. Reineck Pension File. Ibid. ; Ancestry.com and The Church of Jesus Christ of Latter-day Saints, United States Federal Census [database on-line], Provo, UT, USA: Ancestry.com Operations Inc, 2010, Year: 1880, Census Place: Ravenna, Portage, Ohio, Roll: 1059, Family History Film: 1255059, Page: 381A, Enumeration District: 128, Image: 0419; Year: 1870, Census Place: Ravenna, Portage, Ohio, Roll: M593_1258, Page: 455B, Image: 508, Family History Library Film: 552757. 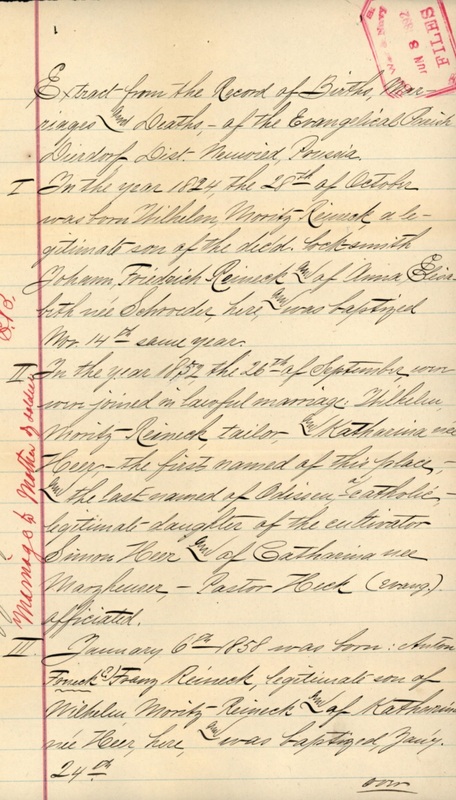 Ancestry.com, U.S. Army, Register of Enlistments, 1798-1914, 1885-1890, L-Z, image 309, line 34. Ibid. ; United States Federal Census,Year: 1900, Census Place: Ravenna, Portage, Ohio, Roll: 1314; Page: 9B, Enumeration District: 0090, FHL microfilm: 1241314. Dakota County herald., October 05, 1906, Image 1, http://chroniclingamerica.loc.gov/lccn/2010270500/1906-10-05/ed-1/seq-1/ accessed 11 Dec 2013. Jana Mitchell, photo., “Frank T. Reinecky,” FindAGrave, (http://www.findagrave.com/cgi-bin/fg.cgi?page=gr&GRid=59152423) accessed 3 Aug 2014. 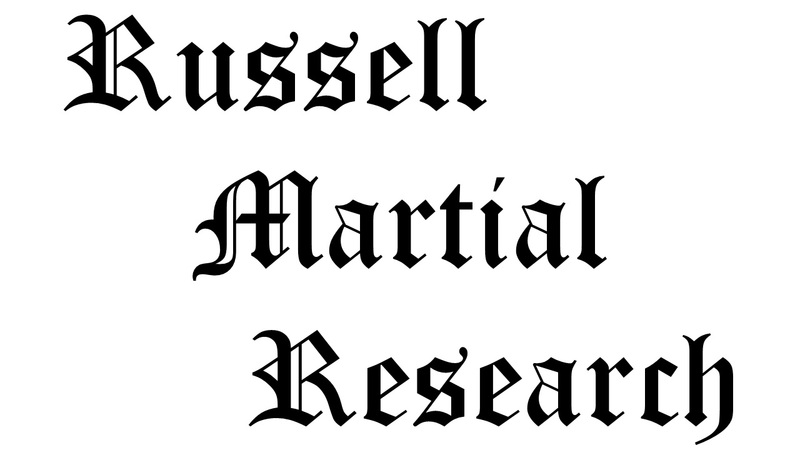 Citation for this article: Samuel L. Russell, “Private Frank T. Reinecky, D Troop, 7th U.S. Cavalry – Killed in Action,” Army at Wounded Knee (Sumter, SC: Russell Martial Research, 2013-2014, http://wp.me/p3NoJy-uS), posted 5 August 2014, accessed date __________. This entry was posted in Casualties, Enlisted and tagged 7th Cavalry, 7th Cavalry Regiment (United States), Battle of Wounded Knee, Cavalry, Cavalry Troop, cavlarymen, Dakotas, Fort Riley, Grabill, Lokota, Pine Ridge, Pine Ridge Agency, Pine Ridge Indian Reservation, Sioux, Wounded Knee, Wounded Knee Creek, Wounded Knee Massacre. Bookmark the permalink.